The giant Panda (Ailuropoda melanoleuca) is a member of the bear family and is an animal with heavy shoulders and a distinctive black and white coat. The male Panda is generally slightly larger than the female. They have a relatively large head and muscular jaws. Their molars and premolar teeth are wider and flatter than those of other bears, allowing it to grind bamboo. The giant Panda is unique in bear species by having a ‘thumb’, which is actually a modified wrist bone that enables the animal to dextrously grasp bamboo stalks. Adult giant Pandas are largely solitary and have well-defined home ranges, they rarely intermingle with each other except during the mating season, which runs from March to May. They make their presence known to other bears by marking trees and banks with scent secreted from glands located beneath its tail. Both male and female giant Pandas vocalize during the mating season, producing calls that can be heard echoing through the mountains. 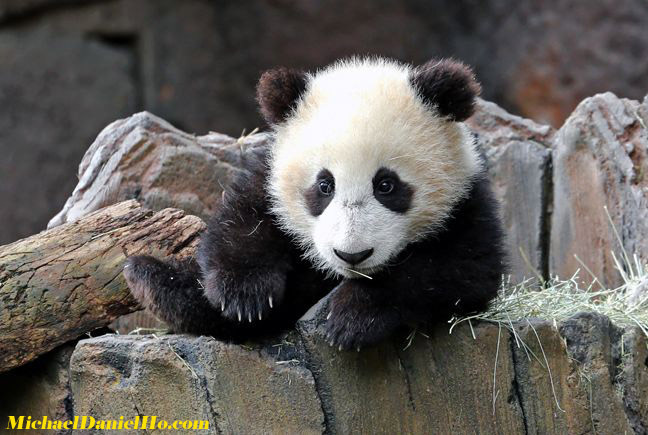 The female giant Panda usually gives birth to a single cub between July and September. The gestation period can range from 3 to 6 months. This is primarily due to a delay implantation process. The female Panda usually gives birth to one offspring between July and September. Although twins are sometimes born, the female rarely raises more than one of the cubs but in managed care, both cubs usually survive because saving every new cub contributes to the shrinking gene pool. The young giant Panda is very dependent on its mother for the first 18 months and the female is free to mate again after that and perhaps gives birth every two to three years. The giant Panda's diet consists mostly of bamboo. As a member of the bear family, it has the digestive system of a carnivore and can only digest a small proportion of its bamboo consumption. Therefore, an adult Panda spends most of its waking hours feeding and consume anywhere between 20 to 40 pounds of food daily in order to survive. The giant Panda is found only in the mountains of China and is critically endangered and next to impossible to find in the wild due to the loss of its habitat and deforestation. The San Diego Zoo in California has a partnership with the Chinese government for a Panda breeding program for over a decade now and recently I went down to see their newest Panda cub, which turned six months old a few day ago. They are such a joy to observe and photograph. You can view more photos by visiting the Panda page on my website.